PENYFFORDD – PROPOSED MEMORIAL INSTITUTE. The question of a war memorial to the fallen heroes of the district has been under discussion at a public meeting. Mr. Hurlbutt of Penyffordd House, was chairman, Mr. Hugh Rogers chairman of the Hope Parish Council, explained what steps were being taken by the Parish Council. — The feeling of the meeting was that whatever form the memorial took it should be centrally situated. Mr. Jakeman proposed, and Mr. 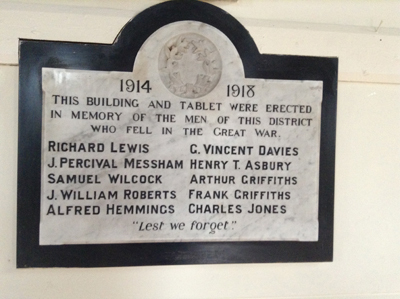 I. Davies seconded, that the Lowere Ward should have it’s own memorial. — After some discussion this was decided upon. — Mr Bimson proposed, and Mr. T.P. Griffiths seconded, that a memorial institute be erected in the village. –This was finally decided upon, and a representative committee was formed to carry on the project.